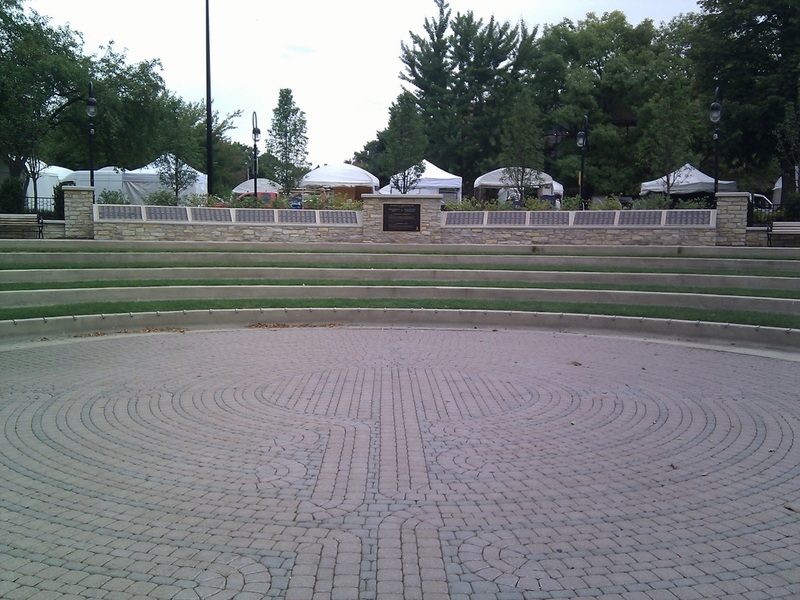 Along the Riverwalk in Naperville, Illinois is the Riverwalk Amphitheater, an outdoor location where free programs are offered year-round through the Naperville Park District and the City of Naperville. Such free programs include musical or acting performances. 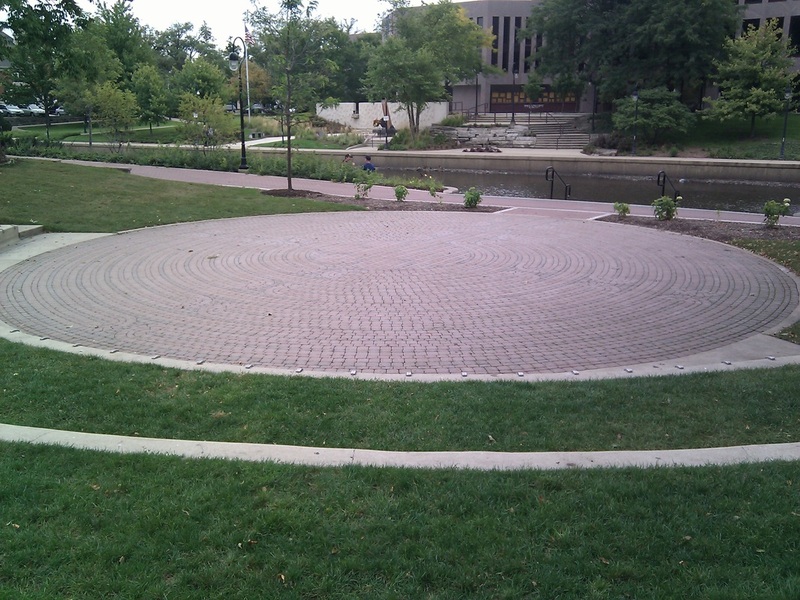 This area is also used as a place for rest, relaxation, and conversation with individuals who are on the Riverwalk. This is a perfect area to sit down, take a break, and enjoy the beauty of nature. Above are some pictures and below are descriptions of such. Image 7 and 8 show a perspective from the top corners of the outdoor classroom, which show the size and shape. Image 9 presents a perspective from a participant sitting within the outdoor classroom – there is a large stepping brick area where a teacher or performer can stand and move around to present. Also, the participant has a view of the flowing river and many trees. Image 10 shows a perspective of a possible teacher, instructor, or performer. He or she would have ample space to talk, move around, and allow students or participants to work in groups or do any other activity. 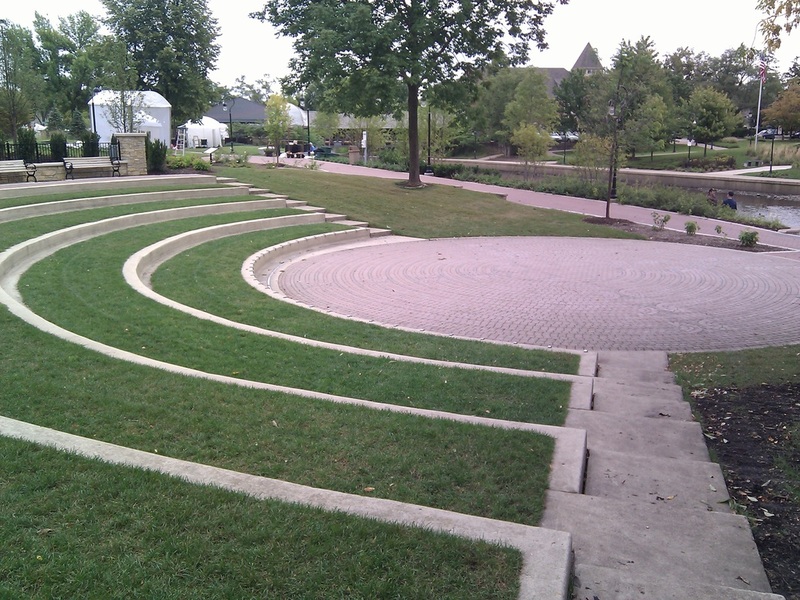 Although this Naperville Riverwalk Amphitheater was probably originally designed for use of musical and theatrical productions, I believe it would serve very well as an outdoor classroom. 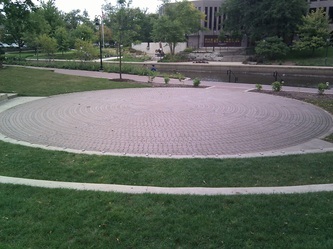 Like the previous outdoor classroom discussed, this one has the shape of a semi-circle. 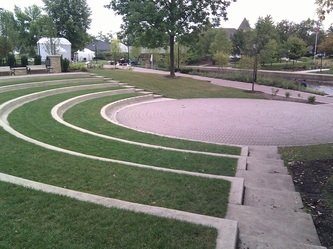 There are stone seating blocks in 5 rows, with grass in between each row. The focal point of all the seating is a large stepping brick area. This is where performers or instructors may stand and perform for the individuals sitting in the audience. One of the main benefits to this outdoor classroom is the location – it is in the heart of downtown Naperville. 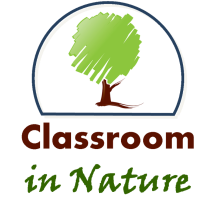 This means that if there is a community education event, there is easy access to the outdoor classroom, with plenty of free parking as well as shops and restaurants participants can go to before or after such an education event. This outdoor classroom is sitting right next to the west branch of the DuPage River, surrounded by trees, flower gardens, and grasses. 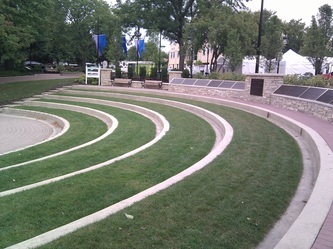 This outdoor classroom also provides for a great location because it is across the street from the Naperville Public Library – the Nichols Library. This would allow for the library to host different community and reading events, where different activities could be hosted in the outdoor classroom. Perhaps an author could read his/her book to a group of children and community members, for example.